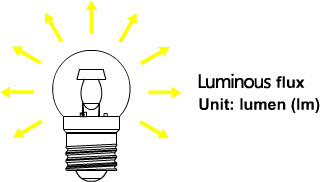 Lumen is the international(SI) unit of luminous flux, a measure of overall light emitted by a light source. 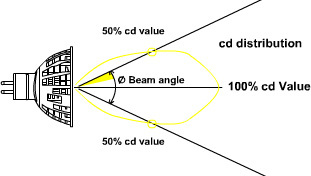 Beam angle is the angle between two directions for which the luminous intensity is 50% of the maximum intensity as measured in a plan through the nominal beam centerline. 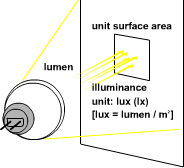 The beam angle of a lamp gives an idea of how the light beam spread away form the beam center. A black-Body radiator will have different color when it is heated up to different temperature(in kelvin). The temperature at which the heated black-body radiator matches the color of the light source is the color temperature of the light source. Design life time is the average life of lighting product when it is operated at nominal lamp voltage, current and controlled working environment. Actual lamp life time varies because of difference from those rating condition. Not all lighting prodcuts are designed for dimming function. 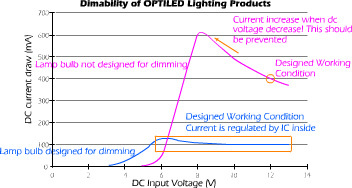 Dimming a non-dimmable LED lighting product will cause un-predictable result and may affect the life time of the products. The below figure shows the typical input current variation while adjusting the DC voltage input to dimmable and non-dimmable product. NEXT：Merry Christmas and Happy New Year of 2018!